Eliminate the costly, cumbersome process of preparing, sending and storing tearsheets to your advertisers. Whether you are a single weekly publication or a daily with multiple publications across your group, MyTearsheets will save you time and money. MyTearsheets allows you to effortlessly deliver digital tearsheets to advertisers in seconds. Advertisers can see their ads the same day they are published and can view an archive of previous tearsheets within the portal for quick retrieval. Providing proof-of-publication to your advertisers has never been faster and more efficient. MyTearsheets is an easy to use system with a robust and elegant interface. 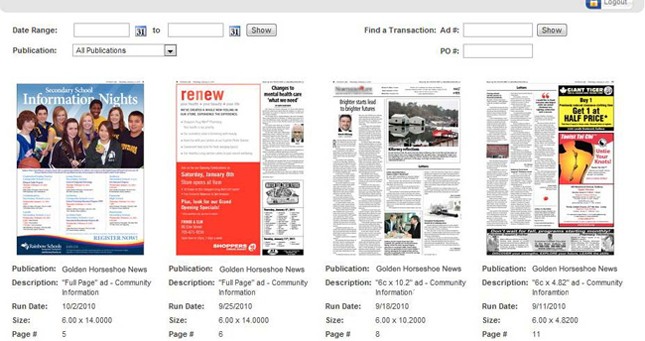 Simply upload your publication PDF file, by selecting the publication or date and MyTearsheets takes care of the rest. Instant e-mail notifications are sent to your advertisers, allowing them to view tearsheets the same day of publication. MyTearsheets enables publishers to focus on generating revenue, rather than getting tearsheets out. Eliminate costs of labor, postage, mailing materials, newsprint and storage space needed to mail out tearsheets to advertisers. MyTearsheets requires no upfront capital investment and only requires an internet connection with a browser.